A RIVER TRICKLES THROUGH IT According to the EPA, the Gualala River has been “impaired” due to sediment caused by logging. BIRD’S EYE VIEW This LiDAR-based vegetation map shows the height of trees located on GRT’s Sonoma County lands and surrounding areas. Many of the biggest concentrations of tall trees (red) are within the company’s planned logging area. By the 1990s, the board-foot volume of Louisiana-Pacific’s heavily cut-over Mendocino and Sonoma county properties averaged a paltry 10,000 per acre—less than 10 percent of their original volume. Environmental activists and some foresters have embraced the term “liquidation forestry” to describe Louisiana-Pacific’s practices, which remained prevalent in most areas of redwood country well into the 1990s, and continues to be practiced in some areas. Before the Burches purchased their land in March it was known as Gualala Redwoods Inc. (GRI). GRI’s owner has degraded its lands but not to the same extent as Padula. But the company has drawn criticism from environmentalists for its rapid cutting rates and reliance on clear-cutting. According to a 2010 Cal Fire report on sustainable forest management, the average annual California timberland harvest covers 1.64 percent of private timberland acres. By contrast, GRI’s total logging since 2004 has covered about 30 percent of its land, which translates to a harvest rate of nearly 3 percent per year—almost twice the state average. Not long after I met Friends of the Gualala River president Chris Poehlmann outside of Gualala Point Regional Park in August, I noticed habitats for live termite colonies on the backseat of his 1982 Mercedes Benz—which he converted to run on vegetable oil. Poehlmann, who lives in Annapolis and builds museum displays for a living, constructed his first termite displays for a client several years ago, as part of a larger museum exhibit project, and soon discovered that the much-maligned wood-consuming insect is an effective means of promoting a sense of wonder about the natural world. He was about to mail the displays in his car to eager “termitophiles,” as he explained to me, in other parts of the country as part of a new product line he is developing. 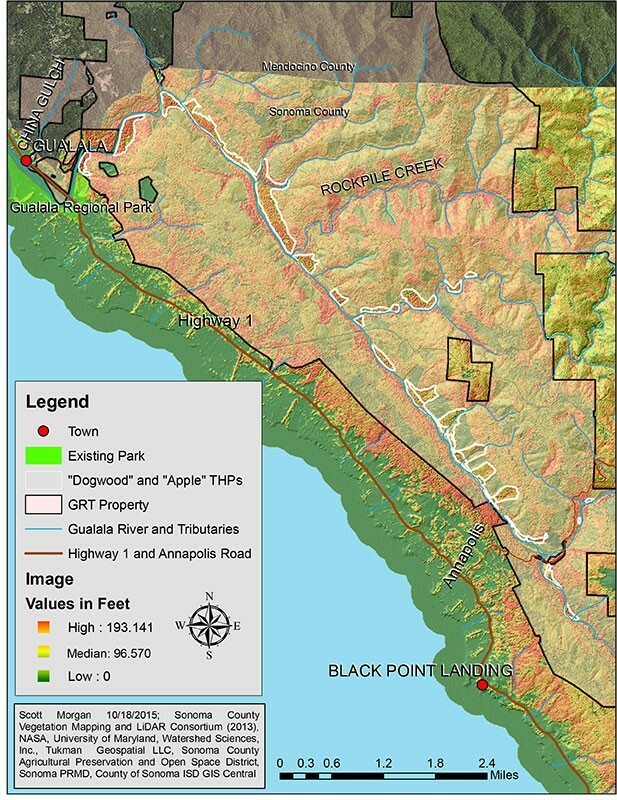 In the 2000s, the Conservation Fund, a land trust based in Virginia, purchased Padula’s former Gualala and Garcia river lands, tens of thousands of acres of young-growth redwood and fir in the coastal mountains. This free market, nonprofit experiment—”working community forests”—calls for limited, sustainable logging as the land slowly recovers. 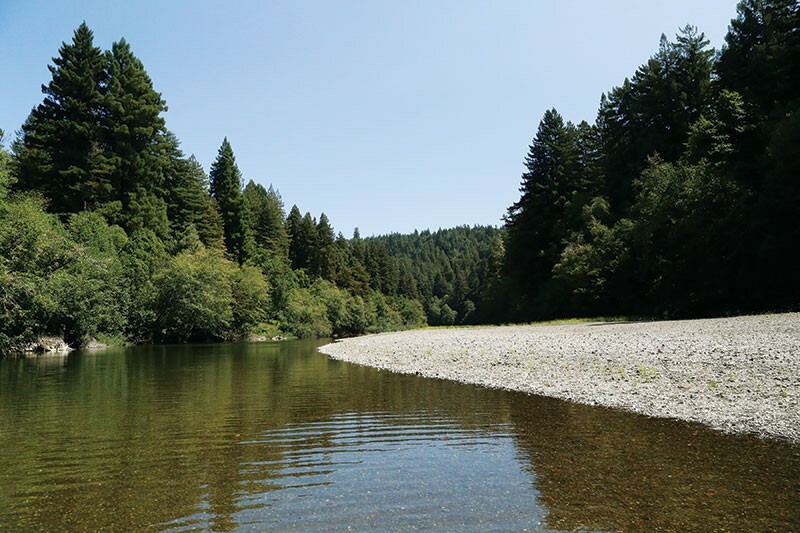 The Fund now owns more than 57,000 acres of contiguous forest in the Gualala and Garcia river watershed, and their land abuts Gualala Redwoods’ property—in a suggestive manner, say environmentalists. Partly as a result of these purchases, the Garcia River, which is directly north of the Gualala and roughly the same size, “has been slowly recovering from its years of damage from logging,” says Alan Levine of Coast Action Group, an environmental organization in Point Arena. In 1999, federal and state monies were used to purchase the 5,600-acre Headwaters tract for a whopping $532.27 million in cash and assets—more than half of the roughly $850 million in inflation-adjusted dollars Hurwitz had paid for his acreage as a whole. The lawsuit against Hurwitz, which included the state and federal governments as plaintiffs, was finally heard in 2009 in Oakland. On the stand, Maranto described how he had discovered the deception several years after the fact. The annual cut rate that Hurwitz consented to in the government negotiations—179 million board-feet—was based on a particular number of trees. After six days, the plaintiffs decided the Bush administration–appointed judge had put too many limits on what they could enter into evidence, so the odds weren’t good that they would convince nine jurors the tan-oak situation was a scam—and that it came from the top. Wilson and Maranto settled for $4 million from Pacific Lumber, which was distributed among the plaintiffs’ law firm and the state and federal government. For his part, Sonoma County Parks planning director Ehret is enthusiastic about an expanded Gualala River Redwood park—even if the logging will continue on land adjacent to the park. “People don’t always realize that, as time marches, there’s some opportunities you never get back,” he says. When the Burches purchased the property, the harvest plans were already queued up, but Alden waited until after the purchase went through to submit them. The Dogwood THP addresses the possibility of selling the land—a move some observers see as a negotiating ploy.